Emily Hall is a Lecturer / Senior Lecturer in veterinary nursing. 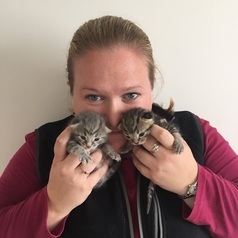 Emily currently teaches on the Veterinary Nursing course, on the Essential Veterinary Nursing Skills module, Application of Veterinary Nursing Care module, and delivering the diagnostics content of the Theatre Practice and Diagnostic Aids module. Emily has worked as a small animal veterinary surgeon in first opinion practice for seven years, working in both city centre hospitals, and small rural branch surgeries. Emily is a panel 2 certified Official Veterinarian and still practices on a part-time basis to maintain her clinical skills. Preparing domestic animals to travel under the PETS Passport scheme forms a large portion of those duties, and Emily has a particular interest in preventative health care for travelling companion animals. Emily is responsible for providing veterinary care to the domestic animals at the Brackenhurst Animal Unit.